Generally, the top picks in the NFL draft are projected to contend, if not win, the rookie of the year award for offense or defense respectively. This year has been no let down as the Offensive Rookie of the Year award is between the top two picks in the draft, Baker Mayfield (1) and Saquon Barkley (2), and the last pick in the first round, Lamar Jackson (32). While Baker and Lamar are both quarterbacks, Saquon is a running back which makes them hard to compare, but it is not hard to argue stats and impact. After serving as the backup to Tyrod Taylor for the first two weeks, Baker Mayfield played his first NFL snap week 3 in a Thursday Night Football matchup against the New York Jets. The Browns were down in this game and Tyrod Taylor was playing poorly. He eventually got injured towards the end of the first half and the number 1 pick entered the game, instantly injecting life and energy into the team. Even though he did not throw a touchdown pass, he lead a comeback and won the game, the first time the Browns had won in over a year. Baker continued to revive Cleveland, leading them to a 7-8-1 record and having a 6-7 record as a starter. He threw for 3,725 yards and 27 touchdowns, an NFL record for a rookie quarterback, along with a 63.8% completion percentage. However, Baker had somewhat of a turnover problem. He was fifth in the league in total interceptions with 14 and fumbled 7 times. He also had a lot of help around him with a very good offensive line, ROTY candidate Nick Chubb at running back, Jarvis Landry at wide receiver, and the emergence of former first round pick David Njoku at tight end. Upon being drafted, Saquon was the consensus top player in the draft. His balance of size, speed, and agility along with his attitude and work ethic made him a highly coveted prospect and the obvious choice for OROY before the season even started. He has been as good as advertised and more. Playing behind a poor offensive line and with a poor quarterback, one would think Saquon would have early struggles. Instead, while facing some of the best defensive fronts in the sport including the Bears, Cowboys, Eagles, Redskins, Jaguars, Titans, Texans, and more, he was able to finish the season second in the league in rushing yards with 1,307, third for total receiving yards by a rookie and fourth among all runningbacks with 721, first in total touchdowns by a rookie and over 2,000 total scrimmage yards, making himself only the third rookie to ever accomplish the feat. Perhaps the most impressive stat is that he didn’t fumble once all season and hasn’t done so since his sophomore season in college. He also helped transform a Giants offense that hadn’t been able to score 30+ points in over 2 seasons and added a new element that helped them get over the 30 point mark 5 times and even hit 40 points once. He also had to run behind an offensive line that ranks in the bottom half of the league which makes his accomplishments even more impressive. For most of the draft process, Lamar Jackson was one of the most interesting prospects. He didn’t run at the combine or his pro day, people wanted him to play wide receiver, and he was supposed to be a second round pick at the earliest. Then, after a while of scouting, Lamar jumped into the first round conversation only to fall back out of it on draft night, but he was selected with the very last pick in the first round, giving the Ravens a 5th year option on him. After a strong start, Ravens’ starter Joe Flacco and head coach John Harbaugh began to struggle, setting up for Lamar Jackson’s NFL debut as a starter against the Bengals in Week 11. He instantly became a problem running the football. He ran for 119 yards but passed for only 150 yards and no touchdowns with an interception. The most touchdown passes Lamar had in a game this season was 2 and the most yards he passed for was 204. However his running ability cannot be ignored as he rushed for 5 yards and averaged 43 rushing yards per game. He also had a serious fumbling issue. Since becoming the starter, he fumbled 10 times not including the playoffs, in which he lost the game on the final drive because he fumbled. Off of stats alone, Lamar Jackson does not look like a Rookie of the Year candidate, but his 6-1 record as a starter during the regular season was the best of all the rookie quarterbacks and was good enough to carry the Ravens to the playoffs for the first time since 2014. In my eyes, the clear cut rookie of the year is Saquon Barkley. Everything he has done this season has been nothing less than historic and he has already solidified himself as one of the best players in the sport. Baker had a great season and there’s no denying it, but he left more of a mark with his outgoing and flashy personality rather than leaving a mark on the game of football. Lamar had success in terms of winning, but he didn’t start the entire season and struggled throwing the ball. 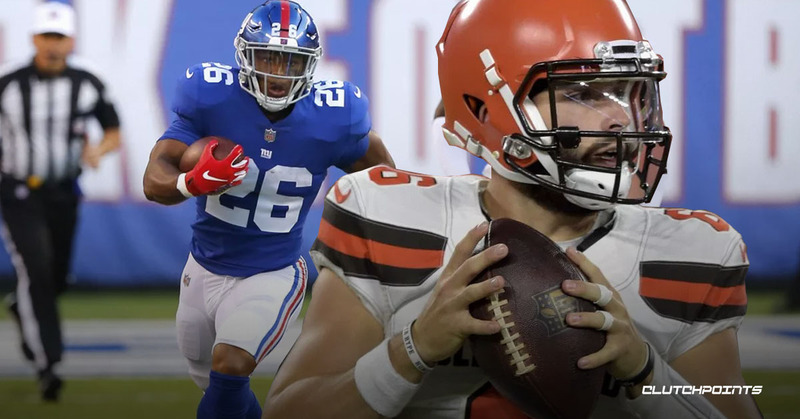 Both of these players, win or lose, have shown that they have bright futures and should be great players for years to come and provide hope for 2 franchises, in the Giants and Browns, who have suffered poor seasons for many years now.